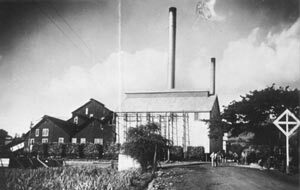 Established in 1860, Pioneer Mill Co. was the first plantation to grow sugar commercially in Lahaina and the company built one of Hawai‘i’s first sugar mills. 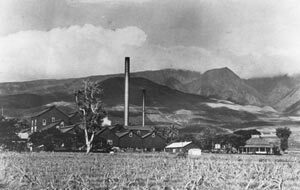 For 139 years, the Pioneer Mill was a mainstay of West Maui’s economy. Almost every resident of Lahaina had some connection to the mill, and if you mention it to this day, it will spark fond memories for many. By 1935, the company cultivated more than 10,000 acres of sugar cane. At its peak in the 1960s, the mill processed 60,000 tons of sugar annually. 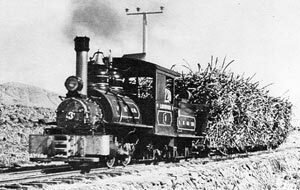 Cut sugar cane was first transported from the fields to the mill by water-driven flumes and cattle-driven carts. 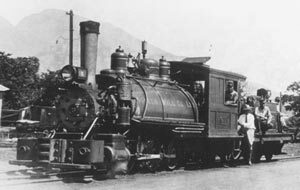 Beginning in the 1880s, it was transported by train over miles of narrow-gauge railroad track along the West Maui mountain slopes. By 1953, trucks replaced the trains. 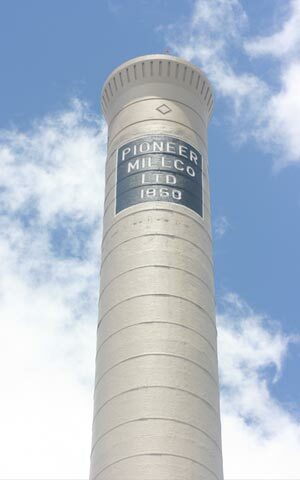 Pioneer Mill Co. erected a 225-foot high, brick-and-concrete smokestack in 1928. It was the tallest smokestack in Hawai‘i and became a natural landmark for drivers as well as a navigational guide for fishermen out at sea. When the mill’s boilers were burning bagasse (fibers leftover once juice is extracted from cane stalks), cloud-like puffs rose out of the smokestack, indicating steam was being produced to generate electricity. People living near the mill or driving by it couldn’t help but wrinkle their noses at the smoky-sweet smell emanating from the stack. 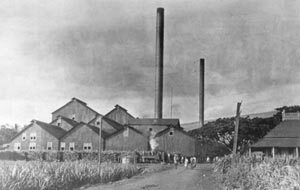 When Pioneer Mill Co. ceased operations in 1999, sugar cane fields lay fallow and the Lahaina mill was left to crumble. Once the last building was demolished and mill owners began to talk about dismantling the iconic smokestack, Lahaina’s community joined forces to save it as a historic landmark. Lahaina Restoration Foundation came to the rescue and assumed responsibility for the $600,000 smokestack restoration project. Maui residents and former Pioneer Mill employees contributed a majority of funds. The four-month restoration included the installation of 17 carbon steel tension bands, a steel door over the flue duct breeching, repair of the exterior concrete, waterproof coating over the entire exterior, and a 14-foot tall carbon steel crown on top. A new crown was commissioned and in 2010, the smokestack was crowned with its new cap. Over the next three years, the area surrounding the smokestack was enhanced with a circular walkway of engraved, commemorative bricks, lawn landscaping and an outer boardwalk. 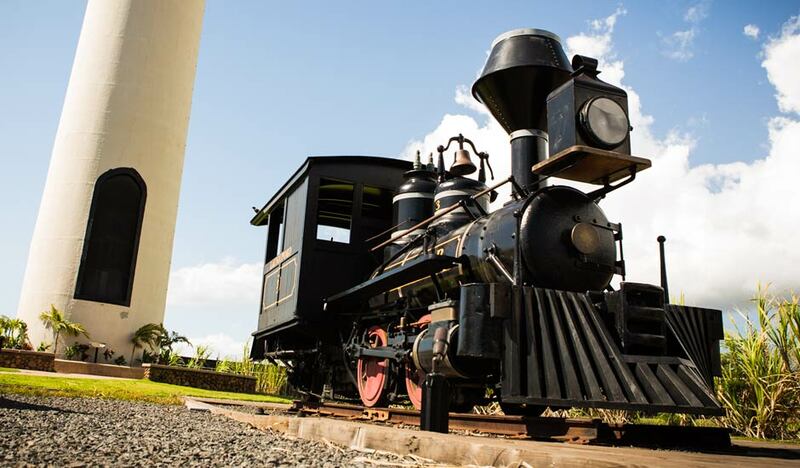 An exhibit was installed that features antique mill and cane field equipment, interpretive signage and sugar train locomotives. 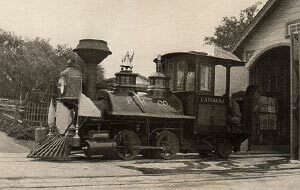 The two locomotive engines on site are named “Lahaina” and “Launiupoko.” They were made in America by Baldwin Locomotive Works in 1882 and 1898, respectively, and purchased for use by the Pioneer Mill Co. These locomotives traveled from West Maui to Southern California when they were bought by an avid collector – Robert Day – in 1952. They were shipped back to Lahaina by the Allen and Lenabelle Davis Foundation, who donated them to Lahaina Restoration Foundation in 2011. The foundation renovated the engines and installed them at the smokestack site. 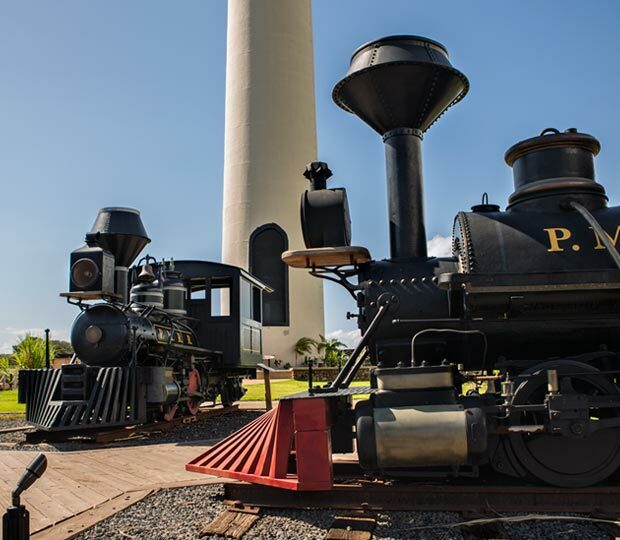 Pioneer Mill Co. Smokestack and Locomotives Exhibit is open to the public daily from dawn to dusk. Parking is available on site at 275 Lahainaluna Road. Admission is free.